Mohammed Rafi, known for his songs and his playback in Hindi films, died over three decades ago. Between 1940 and 1980, he dominated the Hindi film music world and the leading star of the time, names like Shammi Kapoor and Rajesh Khanna, competed to have him sing in their films. However since his passing, there really have been no definitive biographies of Rafi the human being till this volume written by his daughter in law. Yasmin Rafi and her husband Khalid lived in England, near Windsor and life with dominated by visits from their much loved Abba. Mohammed Rafi, from all accounts, was a very affectionate man and his daughter in law was fond of cooking for him. She begins the story with his sudden death and how it shocked her and her husband who were happily preparing to celebrate Id with Mohammed Rafi. The rest of the story of the singer’s life and times is told in flashback from there. Hindi film aficionados with a taste for nostalgia will enjoy going through the biography since it highlights various events in the singer’s life. There is for example the anecdote of Rafi’s work with Guru Dutt for the film Kagaz Ke Phool, when the director begged Rafi to put a little more pain into his voice while recording the song Bichhde Sabhi Bari Bari. Yasmin however does not discuss the famous royalty argument between Mohammed Rafi and Lata Mangeshkar where Rafi believed that a playback singer had no claims on the music director after being paid for the song, while Laa Mangeshkar disagreed strongly. This disagreement stopped India’s two best loved playback singers recording together for three years. Rafi’s career spiralled downwards the moment Kishore Kumar appeared on the scene and sang the theme song in Rajesh Khanna’s Aradhana. He concentrated more on live shows across the world, though ultimately the tension between the two singers was defused enough to allow Rafi to sing playback in two Kishore Kumar songs, in the films Ragini and Shararat. Like a dutiful daughter in law, Yasmin does not venture into any kind of musical analysis but talks instead of shares moments of family happiness or a time when she and her father in law dashed across England so she could cook him daal chawal, papadum and all his favourite Indian treats at her home in London and get him back in time to perform his show. She also underscores the fact that he was loved and recognized by many people both in England as well as India. And that he was so large hearted that he would come out of the recording studios and put money into every hand outstretched towards him for help. For those fans who would like to know more about a legendary singer, the book is full of agreeable anecdotes and shows Rafi the family man, a man who loved cars, the more technicolour the better and who despite all odds managed to break into the Hindi film industry and grow to legendary heights. 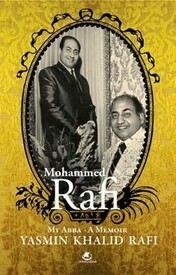 One Comment on "Mohammed Rafi My Abba – A Memoir"
The book is a wonderful peak into the past and gives an extremely vivid and emotional account of Mohammed Rafi’s interaction with his family and people in general. It helps to understand what kind of person he might have been in his personal life and touches upon the simple joys that he cherished. Infact , contrary to what’s written above Yasmin does touch upon the royality disgreement issue that Rafi had with Lata and she has candidly described how the decision might have been taken without careful consideration thus supporting Lata’s views in this particular matter. Actually this is the only instance where she has given a personal view on things. Her description of her childhood is awesome and she has woven different striking moments beautifully together to create a very honest and loving story about family togetherness and bonding.